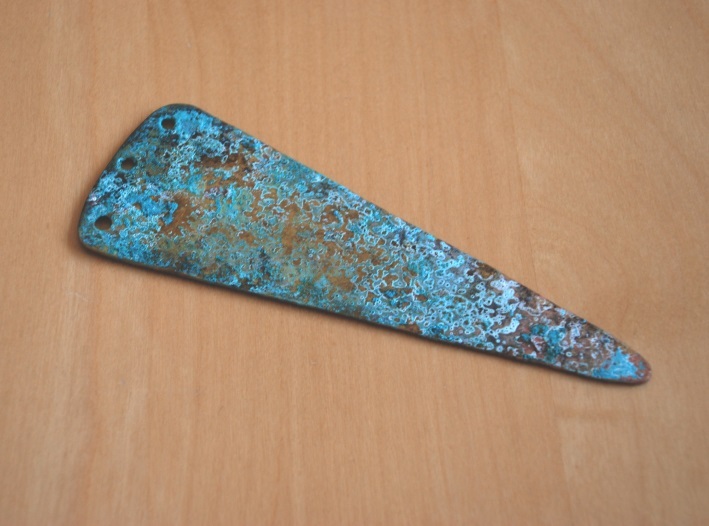 Below is a replica of a Bronze Age Dagger, found in a beaker burial during the A1 Darrington to Dishforth Road Scheme (Brown et al, 2007, the Archaeology of the A1(M), Fig: 162). It was found associated with a impressed ceramic beaker, polished stone wrist guard, and flints. 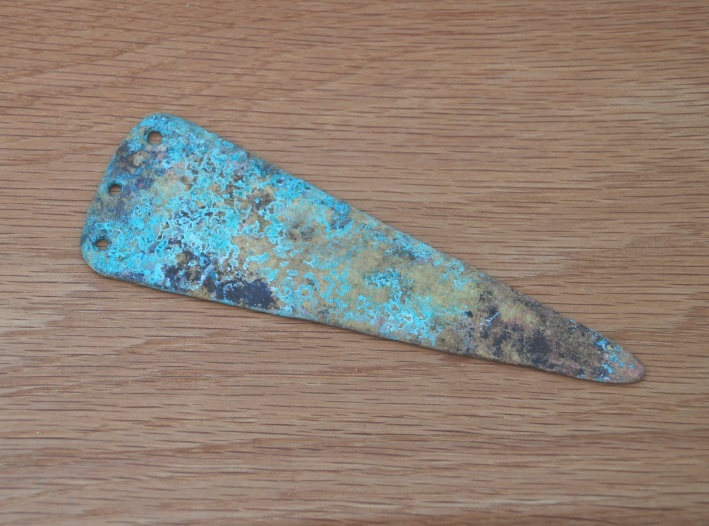 It probably dates to 2210-2030 BC, and consisting of a Copper-alloy blade, and horn scale tang handle, and separate pommel, held together with copper-alloy rivets. This exquisite replica was drawn by the manufacturer, and commissioned by one of the excavators. The edge has been formed blunt so as to render it safe to handle, and legal to display in public, though sharp versions can be commissioned on request. Please drop us an email is you wish to commission one. We have also been commission to make replicas of archaeological finds for museum display by the National Trust. The object had to have an appropriatly aged looking patina. We were able to artificially speed up the aging process on the surface, by a variety of processes, and create a nice verdigris patina, which we then rendered inert and coated in a matt varnish which was invisible, but prevented any of the colour or corrosion products coming off when handled.